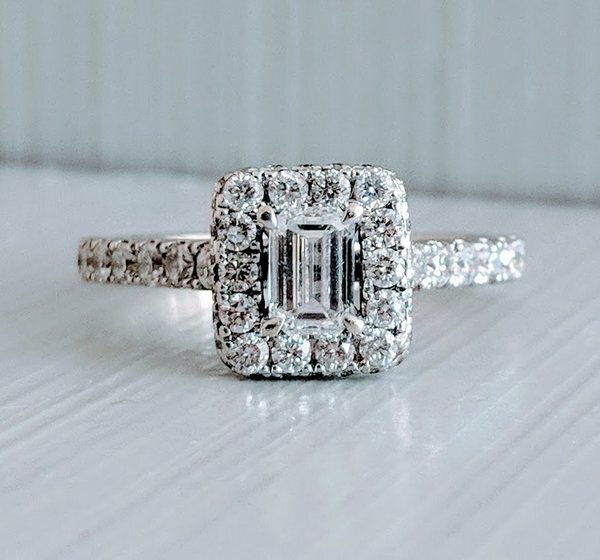 Neil Lane Bridal 1 3/8 ct tw emerald cut diamond halo ring in 14k white gold. This ring was originally purchased from Kay Jewelers for $3851.93. That's not an inflated appraisal price, that's the actual price paid, you can see on the receipt in the photos (and that was a sale price. Full retail price was $4199!). Comes with the purchase receipt and a transferrable warranty from Kay Jewelers. Save yourself $2,000 buying it here! Size 7 3/4 and sizable.